Military veterans who are wounded, injured, or develop a serious medical condition while in the line of duty are entitled to receive veterans benefits for their injuries. These benefits are meted out by the Veterans Benefits Administration (VBA). You will be required to file a petition for benefits with them. 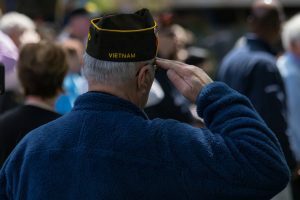 While applying for benefits is not necessarily difficult, the process of proving that your condition is related to your military service can sometimes be tricky. In those cases, it helps to have an attorney on your side who understands the process and how the VBA makes decisions. The attorneys at Comerford Law Office are proud to represent Illinois and Indiana veterans across a wide variety of legal issues. If you want someone to assist you with the process of applying for benefits or need help filing a form 9 or a notice of disagreement to launch an appeal on your denied claim, our attorneys can assist you through all phases of the process. Contact our law office either by phone or online and we can get started right away. Or you can start the process by phone at 800-827-1000. You or a representative can fill out the forms or apply for benefits. If you have an attorney, we will take care of this for you. 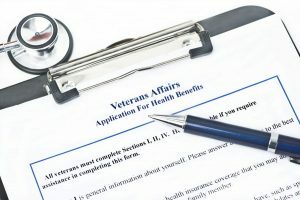 You do not need to submit any medical information or military information to the VBA when you are applying for benefits. They will ask you for that information later. On your end, you simply need to discuss your symptoms, when you started noticing them, how frequently they occur, and how they impact your daily life. You want to keep this simple, If you have multiple medical conditions, you should only list the ones that you believe were caused in the line of duty or form the basis of your claim. The more conditions you list, the longer the processing time will be. In the event that your claim is denied, you are entitled to file an appeal with the VBA. It is at this point that many veterans enlist the aid of an attorney to help manage their claim. You will be required to list the reasons why you believe the VBA has made an error denying your claim. This requires filing a notice of disagreement with the VBA. The attorneys at Comerford Law Office can help you manage every step in the filing of a veterans benefits claim. Our attorneys have successfully managed numerous claims that were initially denied on appeal. Give us a call or contact us online for more information.